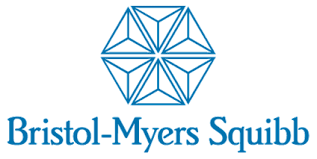 Bristol-Myers Squibb Company, is engaged in the discovery, development, licensing, manufacturing, marketing, distribution and sale of biopharmaceutical products. The mission of this global biopharma company is to discover, develop, and deliver innovative medicines to patients with serious diseases. They took the innovative approach of delivering inter-lab workflow applications through the use of a BPM platform, integrating them with domain specific laboratory information management systems (LIMS), whose workflows are not portable to other domains. Digital transformation of processes in drug discovery has allowed scientists to focus on science and resulted in time savings. "The inability of LIMS vendors to cross domains prompted us to look at BPM as a potential solution. The inter-lab processes were no different than some of the financial and operational processes that BPM had already solved. There was some initial resistance to use a BPM solution as a previous pilot run on another vendor’s‘ solution was not successful. Management was skeptical of the benefit and did not understand how it would work in a scientific environment. This was quickly overcome by running a proof-of-concept with Bonita and demonstrating the ease with which it be integrated in the company environment". The analytical chemistry group in India was under increasing pressure to deliver critical lab results to chemists. The existing process did not keep up with the growing demand. The primary reason was because the process was paper based and created a logistic nightmare for handling of new requests and delivery of results. Chemists used paper form to manually draw chemical structures and to request analytical assays. Analysts were often unable to read the structure or the paper request had missing or incorrect information. Results were stored in a shared folder and the chemists were constantly scanning through the directories to locate their results. With over 500 requests per day and thousands of files the process was onerous! Analysts and chemists wasted valuable time constantly checking with each other (instead of running experiments). Time saving, error eliminated and better performance metrics. Digitizing paper based analytical process resulting in time savings equivalent to 5 FTE’s. Errors due to missing information virtually eliminated. Increased transparency into state of the request reduced the constant back-and-forth between chemists and analysts. As of May 2016, there are 5 applications in production used by 1400 users across US and India. Over 600 new requests are submitted daily. Time savings of 11,000 hours per year realized by discovery scientists. 50% reduction in application delivery time. The need for multiple custom solutions were eliminated resulting in cost savings estimated at $2 million. Increased transparency into lab processes. Access to on-demand live metrics. Simplified and consistent application support. You want to know more about our pharmaceutical customers? The BMS digital transformation project was selected from among 36 entries as a finalist for the Bio-IT World Best Practices Award for 2017. 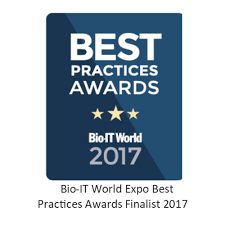 Bio-IT World Best Practices awards highlight outstanding examples of technology innovation in the life sciences. 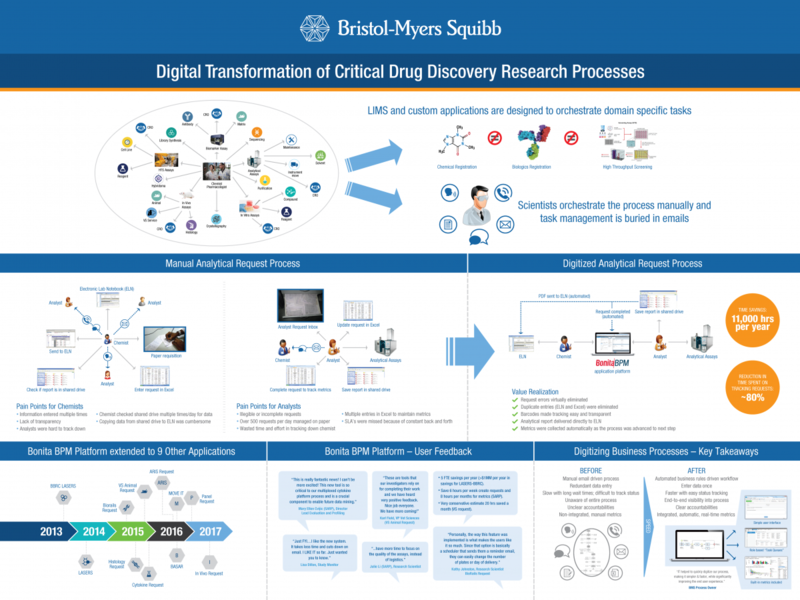 Bristol-Myers Squibb’s entry, Digital Transformation of Critical Drug Discovery Research Processes, was based on implementations of Bonita processes in analytical chemistry, vet sciences, histology, biologics, lead optimization, biomarkers, and lab equipment management across R&D. Bristol-Myers Squibb's entry for Best Achievement of Operational Excellence in Pharmaceuticals & Life Sciences was shortlisted as finalist for the 2017 Business Transformation & Operational Excellence Awards. The successful digital transformations leveraging the Bonita platform was implemented across the chemistry and analytical groups in the Discovery Research organization, beginning with the Analytical Assay Request process. BMS poster about their project. "Now that we have automated the entire process and eliminated manual spreadsheets and handdrawn models, our scientists are focused on data interpretations rather than performing kindergarten tasks of cutting and pasting. Digitizing our paper based analytical process has resulted in time savings equivalent to 5 FTE’s."